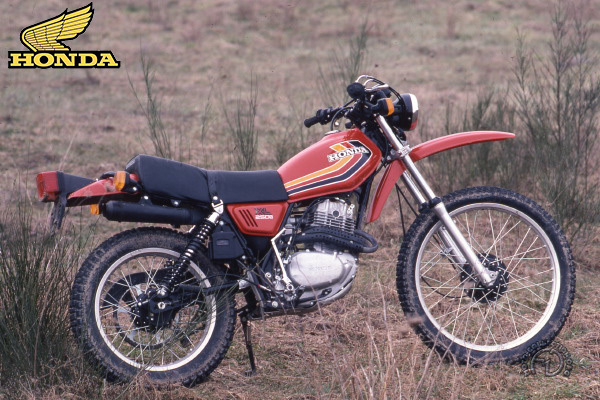 If Yamaha was the company responsible for introducing trail bikes into Europe, it was Honda who introduced four-strokes into this category with the superb 250 XL, launched in 1972. After this brilliant start, Honda made some major tactical errors. In 1974, it tried to shed its image as a company devoted to four-strokes to launch the two-stroke Elsinore range. The following year, Honda swung to the opposite extreme and returned to four-strokes with a new XL, a massive machine better suited to highways than off-reading and which, at over 325 lb, was some 46 lb heavier than the original XL. It was not until 1978 that Honda got back on track. An entirely new design, the XLS was a genuine trail bike, a real all-purpose machine and not a bogus enduro racer. It was at home in the city and on the highway as well as off-road. The XLS was a relative featherweight, with a dry weight of 260 lb. It had inherited its large suspension movements from motocross and was distinguished by its extremely large diameter (23 inches) front wheel. Sadly: this was the bike's biggest fault. No tire choices were available in this diameter. High-speed highway stability was compromised by the gyroscopic effect of that oversized tire, which was replaced in 1982 by a conventional 21 inch wheel. In production until 1971, the XLS did much to revive Honda's image in the trail class.